Understanding where Mars is in its orbit. 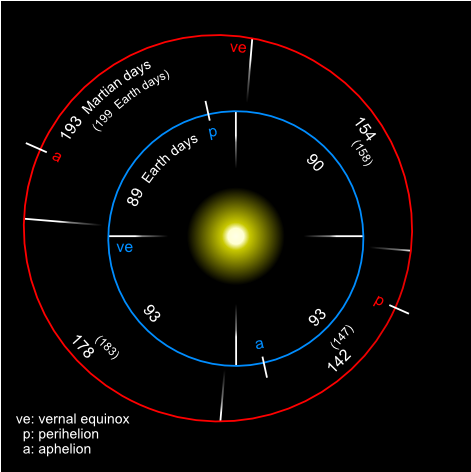 The solar longitude Ls is the Mars-Sun angle, measured from the Northern Hemisphere spring equinox where Ls=0. Ls=90 thus corresponds to summer solstice, just as Ls=180 marks the autumn equinox and Ls=270 the winter solstice (all relative to the northern hemisphere). In trying to understand where Mars is in its orbit, it’s important to know that while all Martian months involve a change of 30 degrees, there is a large variation in number of days in each of the 12 months there, and also a large variation in angular speed around the sun (see Figure 1 and Table 1 below). For the sake of quick reference, Table 2 contains a few useful facts for comparing Earth and Mars orbital parameters and orbital elements. Figure 1 - I found it necessary to correct the REMS Team and JPL about which month it was on Mars back in August 2012. They made the correction, but the level of mistakes made has been high enough to raise questions about what is really going on with the REMS Team. Are they being prevented from revealing the truth about Martian air pressure, or were they simply incapable of distinguishing between hPa and Pa pressure units? Figure 2 - Comparison of Martian and Terrestrial Orbits.